50 million small business owners, just like you, are using Facebook Pages to market their businesses. But … I’m guessing that you (like many of them), aren’t getting the results that you want. When you set up your Facebook Page, Facebook didn’t print out a manual and mail you a copy with a step by step plan on how to get results from Facebook (it would be nice if they did). Everywhere you look, people are talking about Facebook. I’m sure you have had at least one person tell you that you must be marketing via Facebook. Which is all well and good, but as a busy small business owner you only want to spend your time on things which are going to work. And sadly Facebook, isn’t on the list for many. Before I outline why Facebook isn’t working for you, let’s explore exactly what it means to have Facebook working for you. You see often, when I speak to business owners, I hear lots about reach and engagement. And while these are two very important elements of Facebook, I really want you to focus on the end results for your business – new clients, leads and sales. 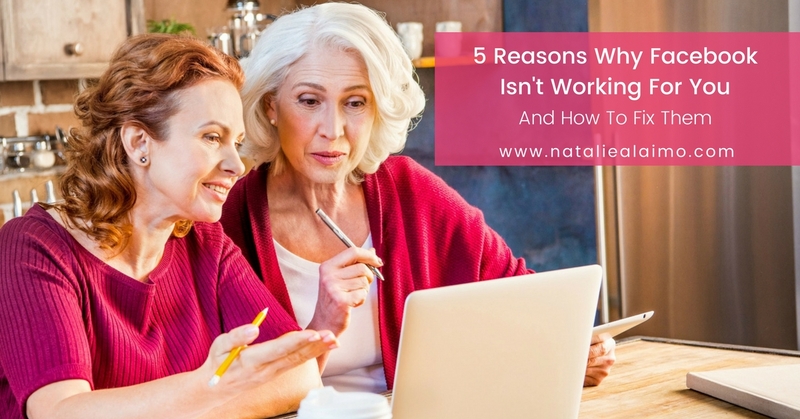 With that in mind, let’s explore the five most common reasons Why Facebook Isn’t Working For You and exactly how you can turn it around. I’ve personally worked with thousand of small business owners, who needed results oriented strategies. Once they understood these reasons why Facebook wasn’t working for them, and fix them, honestly the opportunities for them were endless. When I speak to many business owners about Facebook, I very rarely hear positives (unless they are my students). People are happy to complain about decreased reach, no engagement, etc. but when I dig a little further, the people who are complaining aren’t serious about using Facebook as a marketing tool. When used correctly, Facebook Marketing can be responsible for a huge percentage of your new business and also your repeat business. That is, of course, if you take it seriously. To take Facebook seriously it must form part of your overall business marketing plan, not just something you remember to ‘post’ on once a week, or every second Monday. To get serious business from Facebook – you need an Online Marketing Plan – one that is in alignment with you, your business and your lifestyle. Each month you know exactly what product/service you want to sell more of, and your content strategy is in alignment with this. You are using Facebook to build relationships and move people through your sales process. When you start to think of Facebook as a serious marketing tool, it will become a serious marketing tool for your business. Looking through most people’s content, you see it’s either all; Engage. Engage. Engage. Or Sell. Sell. Sell. Which is completely out of balance. Engagement alone won’t get your sales. And no one likes to be sold to all the time. Both engagement and selling are important to your success on Facebook, however it’s about finding the balance between them both. Using my unique PayMe Formula (find out more about this in my free ebook) you can attract people to your Facebook Page, build a relationship with them and, when the time is right, ask them to purchase from you. The PayMe Formula is your guiding beacon on your online marketing journey and the secret to my success. It consists of three phases – SeeMe + BelieveMe = PayMe. When used correctly, you will always be in balance with the right mixture of attraction, relationship building and of course selling. Reason #3 – Not showing people how to buy! Have you ever been on a Facebook Page and wanted to buy something, but couldn’t? Yep. Me too! People don’t want to be sold to, but they love to buy. Make it incredibly easy for them to take the next steps within your business. To help move your community through the PayMe formula you need a sales process. The exact steps someone needs to move through to becoming a paying customer. From attraction, relationship building and of course sales. Once you have attracted them to your community on Facebook and have built a relationship (this is all done via free strategy content), you then move them into the PayMe phase. From Facebook, what is the exact next step they need to take to be able to buy from you. Do you want them to visit your website, sign up for your freebie (I’ve got an awesome one for you), email you, private message you, call you? Whatever it is, make it crystal clear and simple for people to do. Show people how they can buy from you. Don’t make them guess. Many people forget the “social” in social media. Facebook is a social media platform and for this reason we just can’t talk about our business. In order to really connect with our community we have to talk about other topics they are interested in. Where most people fail with this, is that they don’t really know who they are talking to. Not everyone on Facebook is your customer. Not everyone who has a need for your service is your customer either. You want to find the specific group of people, who want what you offer, exactly how you want to offer it. And it’s 100% possible. You don’t need to be everything to everyone. Who would you like to work with? Are they married, single, divorced, tree hugging hippies who swear and wear tie-dyed t-shirts? Maybe they are June, a mother of two, who after the birth of her second (and last) child, left her fulltime, soul sucking job, to raise her children. Within 3 months she realised staying at home wasn’t for her – so she used her life savings, along with her event management experience to launch – White Weddings – a boutique wedding planner service. She wanted something that was her’s and allowed the flexibility to be with her kids. 12 months down the road, with no savings left, she was desperate for help. Help with her kids. Help with her business. Help with her life. Things certainly didn’t turn out as she had expected. Can you imagine the content you can write to talk directly to June? Knowing your target marketing and building your community on Facebook of them, is one of the fastest way to get traction and real results from your Facebook Marketing. When you know who you are talking to, your content isn’t superficial…. Your Facebook Page and marketing strategy doesn’t exist without content. Yes you can create your Page, upload your branding, however without a steady stream of content, nothing is happening. I’ve seen many people’s Facebook content strategy as reactive and they post whatever comes to mind or pops up within their news feed. And this of course needs to no reach, no engagement and of course no sales. Your content isn’t in alignment with you, your business or what you are trying to achieve (i.e. more clients, leads and sales) To be effective on Facebook, you can’t post superficial content. You have to post content with intent. Content that directly relates to your target market. Content that speaks directly to your market. Content that will connect and convert your audience. What does it take to be successful on Facebook? There are lots of myths and misconceptions about exactly what it takes to be successful on Facebook. Many ‘guru’s sharing miss information and making business owners work a thousand times harder than they actually need to. To help get you started I’ve put together a free ebook on the only four types of content you need to be successful on Facebook. I’ve been successfully using Facebook to market my business (along with thousand of our clients) for over 7 years. Grab your copy of this free ebook and learn how you can finally gain new clients, leads and sales from Facebook.